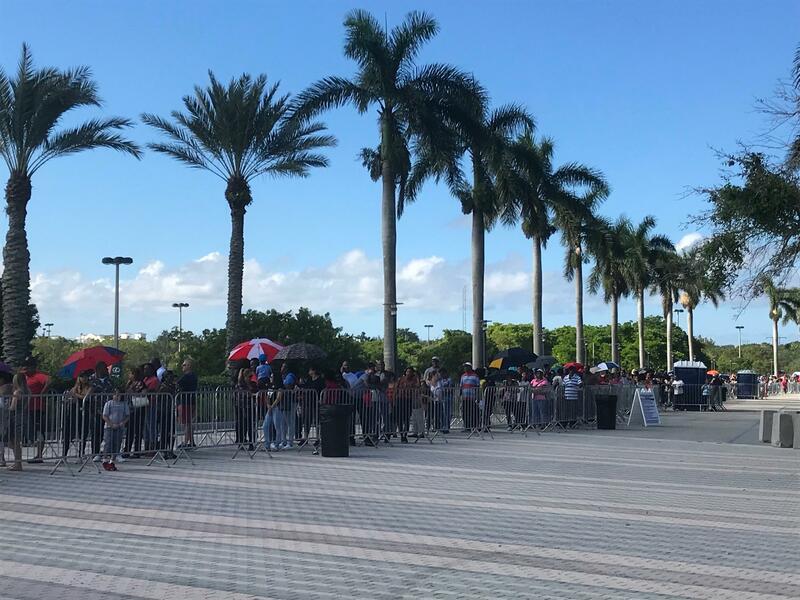 On Tuesday, many people brought umbrellas to beat the heat while waiting hours in line for disaster food stamps at the BB&T Center in Sunrise. 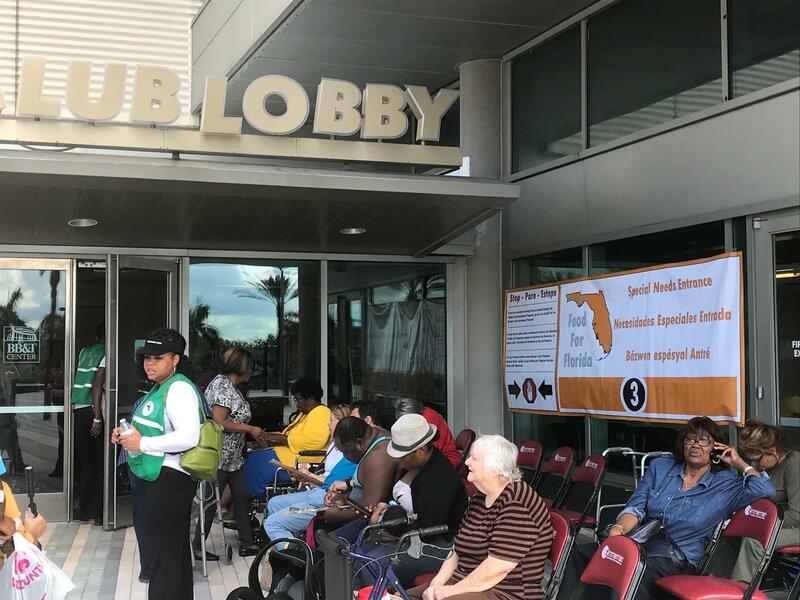 There is a separate entrance and waiting area for people with disabilities at the D-Snap registration event happening this week at the BB&T Center. Here, people who can't wait in the main lines can sit. Tuesday's line of people hoping to sign up for D-SNAP food assistance cards wrapped around both sides of the BB&T Center in Sunrise. On the first day of make-up registration for disaster food assistance, lines were long, while lawyers who were suing over how the program has been rolled out hashed things out in court. People in Miami-Dade and Broward counties have through Thursday to sign up for the Disaster Supplemental Nutrition Assistance Program (D-SNAP) after the federal government granted extra days due to demand and safety concerns at some of the registration sites. But lawyers in federal court Tuesday argued that there had not been enough accommodation made for disabled people. People with disabilities have been waiting in long lines in the sun and rain to register, a process that has to be done in person. While most registration sites did have separate lines for people who needed accommodations or pulled people out of line and used golf carts to bring them to a specific tent, many others were unable to wait even in those lines. Natalie Chardiwal had open heart surgery in May. She waited Tuesday morning in the handicapped registration section of the BB&T Center in Sunrise. Including waiting in traffic just to get into the handicap parking lot from her home near Oakland Park, it took Chardiwal five and a half hours to sign up inside. “I left the house at 5 o’clock [in the morning],” Chardiwal said. Tuesday was the day for people with last names beginning with A through F to register for the food assistance at the BB&T Center. She said the wait was worth it because she and her husband, Sam Chardiwal, lost food during Irma and they don't have health insurance. The long waiting times resulted in a lawsuit filed by the Miami Workers Center and the Health Rights Clinic at the University of Miami asking the federal government to provide some way for people who can’t physically go and stand in line to still have the opportunity to sign up for D-SNAP. While the program is administered by the Florida Department of Children and Families, the program is ultimately controlled by the U.S. Department of Agriculture (USDA). Fulgencio Gallo, who has debilitating back pain, tried to register for D-SNAP twice. The second time, he waited seven hours before deciding to leave because he was in so much pain. He is one of the plaintiffs in the suit against the state and federal government claiming not enough effort was made to help people like him. “I’m hoping to get help,” said Gallo through an interpreter. His home was damaged during Hurricane Irma and his family lost all their food with no electricity. With no income himself, finances are tight caring for a disabled child. While the hearing on Tuesday did not resolve the suit, there is a clear timeline on how things will move forward. Over the next week, the state and federal government will together have to answer questions about a potential solution: Will the federal government allow individuals with disabilities to interview on the phone or through some form of teleconferencing? This has never been allowed for D-SNAP registration due to concerns about fraud, given the fact that the requirements are relatively lax compared to registration for regular food stamps. The final answer on whether that is a possibility will be provided by the USDA on Nov. 16. If the answer is yes, both sides agreed that anyone who pre-registered for the program but was not able to wait in the line would be allowed to interview and that would resolve the issue. If the federal government says no, there will be a hearing on Nov. 20. “It ought to be offered in a way that provides opportunities for the disabled,” said U.S. District Judge Ursula Ungaro from the bench, encouraging both parties to work something out before she is forced to wade in. In the meantime, the lawyers for the plaintiffs are trying to encourage anyone with a disability to register before the window closes Thursday to preserve their tentative ability to interview later on. “You never lose faith; you always have to have hope,” said Gallo. While the court hearing was going on, Juanita Dixon was standing in the regular line for D-SNAP registration at the BB&T Center. "They really don't look out for the handicapped because if they had, I don't think I would have been in the line," she said. Dixon has trouble breathing and says she has many health issues. She was taken out of the regular line and placed in a wheelchair in the handicap sign-up section. By 10 a.m., she'd waited for more than an hour and a half for her chance to get a D-SNAP card. Now the program will continue at the BB&T Center and at the Hard Rock Stadium in Miami Gardens, through Nov. 9. After people looking for food assistance waited in lines up to eight hours long, the state has announced extra days for sign up for the Disaster Supplemental Nutritional Assistance Program, or D-SNAP. The state has processed about 937,000 D-SNAP applications so far. In addition to replacement assistance for people who already get food stamps, Florida has provided nearly $1.2 billion in food assistance. For those impacted by Hurricane Irma who missed out on getting emergency food stamps earlier this month from the Florida Department of Children and Families, there will be a second chance. On Monday, DCF announced Disaster Supplemental Nutrition Assistance Program (DSNAP) benefits will be distributed during a three-day span at a Miami-Dade and Broward site. As Floridians continue lining up for food assistance due to hardships caused by Hurricane Irma, state officials announced they intend to re-open enrollment in two South Florida counties to meet demand. The Federal Emergency Management Agency announced Friday it’s extending the deadline to apply for disaster assistance. Originally the deadline was Nov. 9. It’s been extended to Nov. 24 in all Florida counties designated for relief.